Flora & Fungi Redwork, originally uploaded by crafty bean. This is lovely and cute and pretty and red and funky and I love it. I've got to agree. What stitch are those blades of grass done in? I adore the little ferns. Right! I love it too. I'd love to have the pattern. Love Love Love!! my next project is going to be red and white. this piece is just heaven!! Congrats Bean! 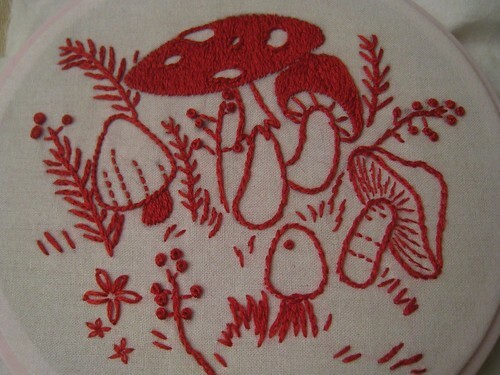 I adore this embroidery, mushrooms are so cute <3 This is totally making me want to do some redwork!